I hate my shower! Well, actually, it’s my shower head that I don’t like. Granted, it’s better than the standard fixture that most bathrooms come with, and it does offer a few water pressure options, but really, does anybody ever use more than one setting? So I’ve been in the market to buy one of those oversized rain shower heads, but finding the right one can be time-consuming. I liken it to trying to search for a new lipstick shade at a Sephora cosmetics store. Ladies reading this will know very well what I mean. Rain shower heads can wash your entire body with a “rainfall effect” from above, as opposed to the more vertical water stream of older models (like the one I currently have). If you’ve ever been to a day spa for a treatment and were escorted to a shower afterward, that’s what a rain shower head looks and feels like. Simply glorious! I’ve decided that I want something sophisticated and stylish but still within my price point, under $150. I’d like an oil-rubbed bronze unit similar to the one that my mom recently installed in her downstairs powder room. Yes, she still insists on referring to it as “the powder room,” something I’ve never understood since I’ve never seen any powder in there. Anyway, Mom’s rain shower head was part of the complete bathroom remodel she did a few months back, which included tiling the bathroom walls with earth-toned tumbled Travertine and granite inside the shower. Adding the Travertine has given the bathroom a warm, Tuscan vibe. She also installed a wall-mounted, oil-rubbed bronze rain shower head. It’s the size of a dinner plate, designed by Grohe, and yes, it came with a hefty price tag. However, there are some similar choices that are more appropriate for my wallet. 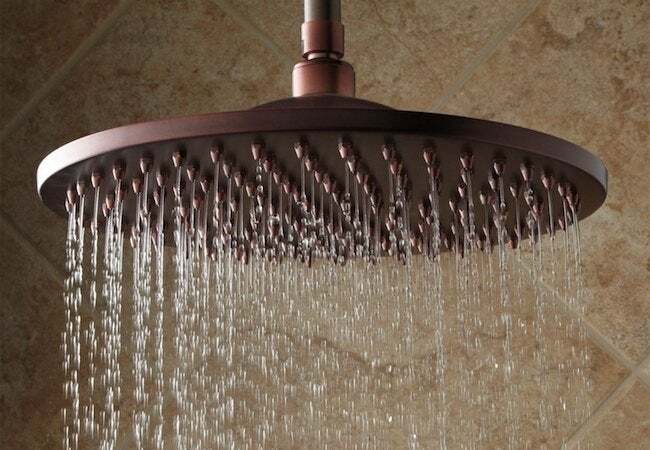 For example, FaucetDepot.com, Moen, Delta and Price Pfister, all offer wall-mounted oil-rubbed bronze or brushed copper finished rain shower heads for around $130 and under, and they can be found at home improvement stores such as Lowe’s and The Home Depot. Other simple ways to add some zip to an older bathroom’s appearance without spending a fortune may include installing a new towel rack, updating faucets, swapping out light fixtures, or adding a fresh coat of paint.